Make a How To video on anything at all. Are you skilled at Building stuff? Is Loom Banding or Creative Craft more your style? Whatever your Ability is we want to see it! What is Check This Out all about? This website is for you; the kids out there that have special talents and skills that you want to share. Check This Out lets you show off your ability with a chance to win great prizes and gain recognition. Each week selected new videos and entries will be put on the site. Voting will be open for that week with the winners being announced the following week along with a new selection of videos to watch. Everyone of any age has an equal chance for their video to be viewed. This website is G Rated so all videos selected will be appropriate for kids of all ages. 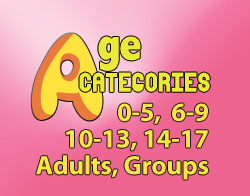 The age categories will help you navigate the site so you can see what kids your age are up to. Think outside the box and you never know what you might find. We are looking for funny, exciting, interesting, inspiring, thoughtful, educational and memorable videos and entries from all kinds of kids on all kinds of topics. You could become the next big thing. Videos must be no longer than 3 minutes. They must be submitted in the correct age group with a title. Videos shown will be selected from all entries submitted. Videos that have an inappropriate nature will be deleted and not shown on the site. Any Business interested in advertising on this site or wanting to supply prizes please contact Check this Out.